This is the premise for The Back from the Future bloghop going on today...all day! Brought to you by Suze over at Subliminal Coffee, M. Pax, and Nicki Elson at Not-So-Deep Thoughts, it looks to be a lot of fun. What are you waiting for? Hop around...check out some new blogs...see what the future might have in store for them! This could be heavy, Doc. When I opened the shoe box I would have sworn it was just some sort of stunt. Yeah, I signed up for the blog hop and figured it'd be a lot of laughs. I never expected something like this, though. I mean, how on earth did they get my address? The more I began going through the box, the more I got the eerie feeling that this wasn't a hoax. I mean, first of all the name brand of the shoe was "J.Biebers". I shook my head thinking it couldn't be. I mean if someone was going to pull a gag, you would think they could do better than "J.Biebers". A chill ran down my spine. Inside I found a very worn, used, copy of a book called "The T.E.M.P" Agency", with my name as the author. The cover featured a ruggedly handsome man in a hat and trench coat, a deep cut in his chest revealing blinking lights and fiber optic cables, as he stood in front of a gypsy woman protectively. I shook my head...."It can't be, I thought....I...haven't...finished this yet." On the inside cover, in my handwriting, were the words "The first of many!" Slowly, I turned the book around to the back cover and saw a black and white picture of me staring back at myself with a smirk. My eyes widened and I could tell that it was the same face I stared at in the mirror every morning....just with a few more wrinkles. My hair still cut short and cropped as it is today. "Well...at least I still have my hair." I said to myself, my fingers running through my short cropped, receding follicles. The more I rifled through the box, the stranger it got. I found a pair of front row tickets to a concert. The headliner, strangely enough, had the same name as my nephew. There was also an invitation to my sister's wedding, dated just a couple of years from today. "Whew! At least mom and dad can quit worrying." I thought as I stared in awe at the artifacts, obviously from the future. The biggest shock, though, was when I looked at the only picture in the box. It was me and my wife, posed with two sets of twins. Two boys and two girls. It made sense as my mom and my wife's mom were both fraternal twins. "I better start saving some money...." I thought. The very last thing I pulled out of the box. The thing that filled me with the most hope. An envelope. No stock tips....no clue on who wins the next ten World Series or Super Bowls...nothing. The way I figure it, though,is that 'future' me knew how lazy 'present day' me is and, if my life got any easier, I'd probably give up writing for laying on the beach or something. Either that, or 'future me' might have thought too much info could punch a hole in the space-time continuum the size of Belgium. Who knows? "Your future is whatever you make it....so make it a good one." And that's just what I did....or will do...or....well, you get the idea. 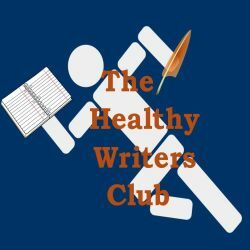 Since it's Friday, it also means it's time for a 'getting healthy' update and The Healthy Writers Club. Shalle McArthur hosts the club each week and we come together to discuss all those fun (can you hear the sarcasm?) topics such as losing weight, getting in shape, eating right, etc. Unfortunately, this week isn't much of an improvement over last. I did, though, manage to work out once this week as well as go for a couple of brisk walks with the wife. I haven't been keeping up much with MyFitnessPal, but try to pop in to encourage my fellow fitness enthusiasts. On the flip side, I'm not really eating a lot or even badly....but I know I should still, at least, be confirming it with some sort of calorie measures. While I'm still nowhere near where I should be, I'm getting closer. Hopefully, I'll have a better report next Friday. What might 'future you' send back to 'present you'? In shape? Getting there or just thinking about it? Here's hoping you all have a great Friday and an even better weekend! I'd like to think Future Me would send a copy of my finished novel, just so I could be assured that I actually do finish it some day. Fun blogfest! I love the concept and the movie. Great post for the FROM the future hop :) Nice touch with the note. Totally agree that our futures are ours for the making! I'm mostly in shape but could be more toned. Loved your story for Back from the Future! My favorite lines were- At least I've still got my hair- and-I'd better start saving money. Great idea. Now you know - just stay the course! Yes, the line about the hair was great. loved going thru your future stuff with you! it's funny how wevtalk to ourselves. this hop is revealing more about us to everyone than we think! Looks like you did good for yourself. ER, WILL do good for yourself. One thing you need to change for your future-get a coffemaker that will have your coffee ready before you get up. I can't live without that. Very clever Back to the Future note. If only we had that kind of note and evidence that the future would be ok. Fun post. @M.J: Great idea...knowing all your efforts wouldn't be wasted! @Heather: Thank you and I agree...wouldn't want to know -too- much or we could ruin it for ourselves. @Al: No doubt about that and thanks! @Jaybird: Thank you much and it's great that you're out there and walking. To me there's never such a thing as "just" a mile...or two miles...or whatever. You're doing -something- and that beats doing nothing. That would be awesome if you did a 5K and let me know how you're progressing. Best of luck! @M.J.J: Yes they do...if only they didn't take so long! :) Have a great weekend! Mark, when I read Doc's quote after reading your words, I got a little verklempt. You have such a good heart and it's written all over your contribution. I lift my subliminal coffee mug to your future! Huzzah and nicely done. A good entry and fun to read. Two sets of twins? Egad. Loved the inclusion of your family photo, and the family mementos like the concert tickets and the wedding invitation! Plus I love that you have your book cover envisioned in detail. Fitness is tough . . .I have had on of those 2 days is better than none kind of weeks, and I gave up dessert in the evenings . . .but I don't want to talk about the calories I'm consuming at other meals. Hope you have an awesome weekend Mark! And that your fitness goals really take shape next week! Yeah, if we hostesses were going to mess with you, we'd have done WAY better than J.Beibers...but really, probably not because that cracked me up! Methinks future you is very wise. Good luck with the twinnage. I'm working on making today good and hoping the future will fall into place. Twins! We have some in our family. Fun. Exciting. Expensive. Rewarding. Great list of things to expect - especially the first of many books! @Suze: I really like that quote and thank you. Great idea for a bloghop, too! @Nicki: Haha...let's hope he is...er I am...er... At this point we'll settle for just one, twins would be great, though. I love this blog hop. 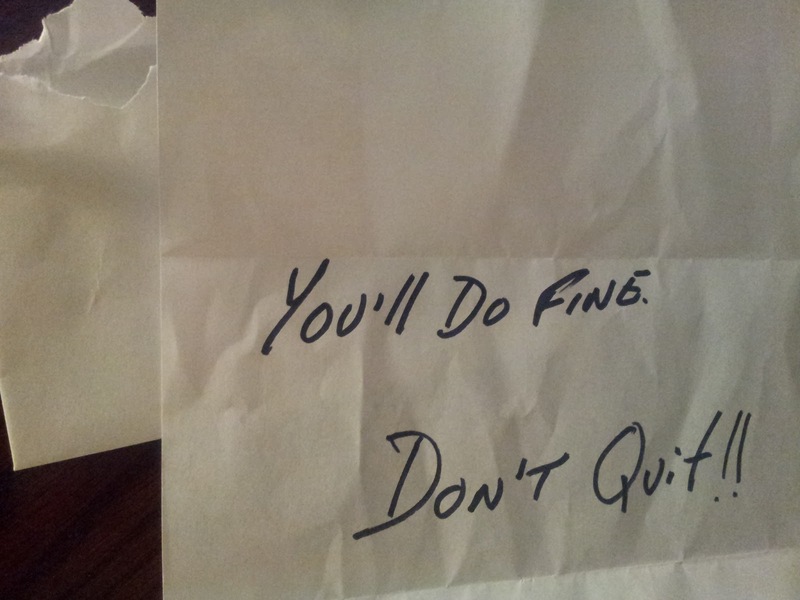 I need a back to future note like that too. Have a great weekend. I loved your peek into the future. Sounds like you are going to have a busy few years ahead! Nice note to yourself and I like the title Temp Agency. I look forward to reading it. I did all my workouts this week. I was very good. It will mean I lost no weight though. Most likely. @Suzanne: Thanks and I sure hope so! That would be pretty cool if we could see into the future, huh? Really liked the encouragement part. We need that always. Hope you get more exercise in next week. You did one better than me this week. I don't think you could be too lazy with 2 sets of twins in your life!! :-) Thanks for stopping by my blog, and thanks for the follow! @J.L. : I think encouragement could be the most valuable thing we could send to ourselves. I'm going to give it the old college try, for sure on the exercise front, so we'll see. Aww, I love the note from your future self. And I had to laugh about saving money for the two sets of twins. No doubt! What an awesome box! Yeah, you better get saving money, but oh, what fun times you'll have. I especially love your little note. :) Have a great weekend! Love how your future you knew just how to motivate you. For your fitness, just take each week and do your best. I'm sure you'll reach your goals. I'm having fun reading what's in everyone's future box! @Christine: Thank you Christine and have a great weekend too! @Kathy: Yep, I'm sure he's gotten enough practice :) Baby steps are the key, for sure. I just have to make sure to make them 'grown up' steps at some point. @Carol: Thanks and me too! I'd like my future self to leave me a message saying my book is a best seller. Every writers dream, right? @Wendy: That's be one of the best message, in my opinion :) Thanks for stopping by and the follow, I appreciate it! Part of the Healthy Writers Club. I'm in shape because I work at staying in shape. My health is just as important to me as my writing. This comment comes from the future and no, not just referring to a time zone ahead of you. I can tell you that it be true. "You'll do fine" And of course, you didn't quit! Peace and fulfilling writing, shall fill your heart. Be well and smile, my friend. I love what you found in your box! Such a great description and I laughed about starting to save money. No one can actually afford twins, let alone two sets. :) Great job! A simple note from the future would work wonders for me. Encouragement. Means more to me than anything else. Nicely done. I really hope you get those kids!!! I'm sending you some prayers and lucky vibes!!! Great ending-you spoke to the artist in all of us! @Krista: Haha, yes I'm getting the feeling that twins would be very expensive...especially two pair! Thank you! @Stephen: Thanks and I agree...encouragement would be the most valuable things to send down the line. @Lexa: Thank you :) Yep, it's something I tell myself quite often. @Dani: Thank you very much, Dani...we really appreciate that! Your post resonates with optimism and a good-hearted sense of humor. Love it! At my age, I'd be happy if I'm still around in ten years to send myself a note of encouragement. Just kidding. (Sorta.) As for being in shape and exercising, yeah, I think about it quite a lot. I don't necessarily DO much about it, but at least my brain cells are pretty buff. Nice to meetcha. Count me in as your newest groupie. Haha, yeah I think about it more than I do it and need to change that. Nothing wrong with buff brain cells though! I've decided it's easier to write a novel than get one published. Good luck. I'm enjoying reading these back to the future posts. Your last note is priceless. I would hope the future me would send a similar note too. i'm so gonna steal that note from you!!! I don't know if I'd like to see a picture of myself in ten years. LOL! I liked your contents - especially the note to yourself! @Joyce: Of that, I have no doubt! @Elise: Me too, it's been a fun hop :) Thanks and I'm sure yours would do the ssame. @mshatch: Me too, one of my favorites! You now and future you both seem rather adorable! In mine would be a passport filled with stamps from all over the world France, Italy, Morocco and Turkey in particular. Also a script from my television series about werewolves. @Melissa: Thanks and the script idea is a great one! @Lauryn: Hi Lauryn and thanks a lot, I appreciate it!